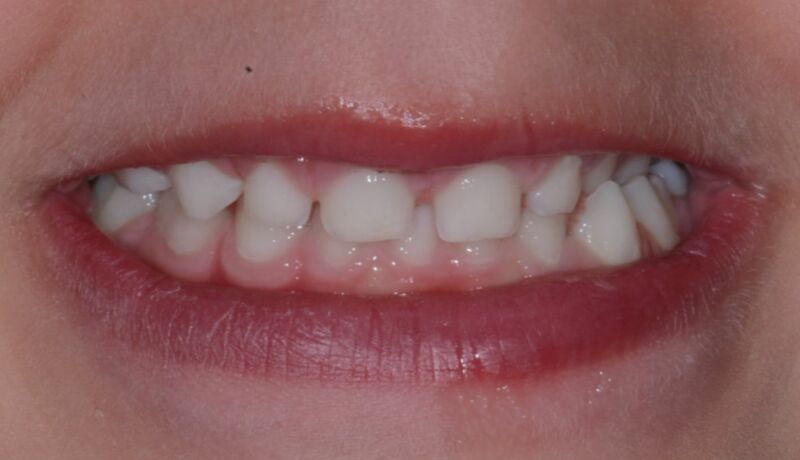 The deciduous teeth (milk teeth) erupt between the ages of 6 months and 2 ½ years. Their miniature anatomy is to blame for the rapid progression of caries, and for this reason the first check up with x-rays should be done early. Examining a child who is not in pain is sometimes already an achievement. To wait until the child has a toothache before going to the dentist is not a good idea. If a deciduous tooth is extracted prematurely, it is mandatory to place a “space-maintainer” so that the underlying permanent tooth can erupt naturally, avoiding an orthodontic correction. A regular follow-up at an early age is therefore important to follow the natural development of the permanent dentition. Regular check ups also permit a revision of the brushing technique, for example with the help of plaque revellers. Sometimes a misplaced milk tooth needs to be extracted so that the permanent tooth can erupt into its proper position. Your dentist can advise you on this topic. Between the ages of 7 to 11 years, the deciduous dentition will be replaced by the permanent teeth (on average). The first permanent tooth (1 st molar or “6 year molar”) develops behind the deciduous molars. This is the tooth which is the most often subject to caries because of the difficulty of brushing the area in a small mouth. The eruption of molars can be slightly painful, the pharmacies sell toys to bite on to diminish the discomfort, and they also sell anaesthetic cream which can be useful.